Rinse and drain beans; trim and discard stem ends. In a baking pans, mix the beans with half the olive oil; spread level. Bake in a 450º regular or convection oven until beans are slightly browned and tender when pierced, 15 to 25 minutes. If using 2 pans, switch pan positions halfway through baking. Stir the sesame seeds and the sesame oil into beans; continue baking until seeds are golden, about 5 minutes longer. Pour into a bowl, add soy sauce to taste, and mix well. Alternately, toast sesame seeds ahead of time. Place in a small dry skillet and cook over medium-low heat, stirring constantly, until fragrant and lightly browned, 2 to 4 minutes. Then add the seeds and the sesame oil at end of cooking. Clean the beans and cut them into 1" long pieces. Blanch (or use frozen beans), drain, cool, set aside. Heat oil in a large frying pan. Season the mustard seeds. When they begin to pop, add garlic and stir till light brown. Add crushed red chilly and stir for a few seconds. Add green beans, sugar and salt. Mix well. Simmer the flame, stir and cook for about 8-10 minutes or till they taste spicy. Sprinkle pepper powder, mix well and serve. Heat the oil in a large frying pan. Add mustard seed. When they begin to pop, add garlic and stir till light brown. Add red pepper and stir a few seconds. Add green beans, sugar and salt, stir to mix. Turn heat to medium low, stir and cook about 8 minutes or till they taste spicy. Add pepper, mix and serve. A very quick and easy way to cook green beans which could be served with any Western food as well. You can adjust the heat with the amount of chilli pepper that you use. 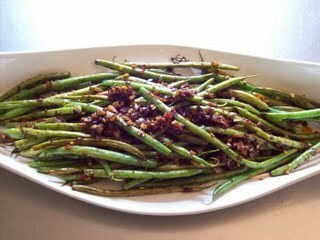 Haricot Vert work as well as regular green beans. 1 pound (450g) fresh green beans. Trimmed, cut into 1 inch lengths. Blanched in a pan of boiling water for 3 - 4 minutes and then rinsed under cold water. Put the oil in a frying pan over medium heat. When the oil is very hot, add the mustard seeds, as soon as they begin to pop, put in the garlic. Stir the garlic until it begins to brown. Add the crushed chilli pepper and stir. Carefully add the green beans (if they are still damp they will spatter a bit), add the salt and sugar and stir. Put heat on medium-low and cook for 7 or 8 minutes stirring occasionally. Add the black pepper and serve. An incendiary vegetable dish from southern India, with a clean, clear heat that intensifies the flavor of green beans rather than masking it. Place beans in a 3-quart pot. Add chiles, salt, and just enough water to barely cover, about 1 cup. Bring rapidly to a boil, cover, and lower heat to medium. Cook for 4 minutes, until the beans are crisp-tender. Uncover, raise heat to high, and boil off all the water, stirring frequently. This should take only a minute or two. Heat oil in a 12-inch skillet until it is fragrant. Add onion and cook over a medium-high flame until onion begins to brown along the edges. Add beans, lower heat to medium, and saute, stirring, for about 5 minutes more, until the flavors are well blended. This dish comes from Rajasthan and is said to be a 'Marawadi-style' dish. Recommended. Put a heavy skillet over medium-high heat and when it starts to heat add the oil. When hot, add the mustard and cumin seeds and the dried chilies and stir until the mustard seeds start to pop (stand back!). Now add those cute little rings of green beans and stir-fry for about 2 minutes - And keep them moving in the pan, making sure all are coated in the spices and oil and none start to burn. Pour in the water and immediately, turn heat to medium, and put the lid on and cook for around 8 to 10 minutes tops - until the beans are almost tender (they should still have a bit of crunch, as if they were intended for a Chinese stir-fry). With the lid Off, raise the heat and add the coriander, salt and sugar. Stir well, and wait until the water evaporates and the beans just start to think about sizzling. These are simple and much tastier than I would have imagined. A keeper! Saute 5-7 minutes in ghee mustard seed, julienned ginger, then green beans. Add water and simmer covered. Add rest of stuff. Stir. Note: Again see recipe above for more about technique. Source: Eileen's notes probably from a TV program years ago. The seasonings are typical of India's southeastern coast. Serves 4. 1 Tbs. salt lus 1/2 ro 3/4 tsp. Bring 2 quarts of water to a rolling boil. Add 1 Tbs. of salt and the beans. Boil rapidly for 4 minutes, or until the beans are cooked through. Drain, and if not serving straight away, rinse under cold running water and drain. Set aside. Just before serving, our the oil into a large frying pan and set over medium-high heat. When the oil is hot, put in the asafetida, mustard seeds, urad dal, and chilies. As soon as the mustard seeds pop and the dal turns reddish, put in the curry leaves and then the beans. Turn off the heat. Toss the beans and mix well. Add the lemon juice, cayenne, and 1/2 to 3/4 of the remaining salt. Mix again. If the beans have not heated through, put them on very low heat until warmed through. Source: From Curries to Kabobs: Recipes from the Indian Spice Trail by Madhur Jaffrey. This Sichuan is a nice spicy green bean dish. The Sichuan peppercorns give it an unusual flavor. Remove strings and trim the tops and tails of the beans. Cut into sections about 2 inches long. Cut scallions at a steep angle into thin slices ("horse ear" slices) about 1 1/2 inches long. Heat 2 Tbs oil in a wok over low to medium flame. Add beans and stir-fry over medium heat for about 6 minutes, utnil they are cooked and tender with slightly puckered skins. Remove and set aside. Heat 2 Tbs of fresh oil in the wok over a high flame. Add the chilies and Sichuan peppercorns and stir-fry very briefly until fragrant. Add garlic, ginger, and scallions and stir-fry a few more seconds. Throw in the beans and stir and toss. Salt to taste. Trim the beans and break into pieces around 6 or 7 cms. In a heavy saucepan, heat the oil, add the curry paste and fry until fragrant, about 1 minute. Add vegetable stock, beans, bamboo shoots, and bring to a rapid boil. Cook for 15 - 20 minutes, adding additional stock or water as necessary. Continue to cook until the beans are very well done and have absorbed the flavour of the curry-vegetable broth. Serve over rice in bowls, or as part of a curry dinner. Clean and steam the green beans until tender but firm. Immediately place in a bowl of ice water, or under cold running water. After the beans cool, drain, cover with plastic wrap, and set aside. While the pasta is cooking, combine lemon juice and white wine in a small non-stick skillet and cook over medium-high heat until reduced to 2 to 3 tablespoons. Add salt and cream and reduce to about 2/3 cup. Remove from heat and stir in one tablespoon of the lemon zest. In a large bowl, gently combine the pasta, lemon cream, green beans and minced parsley. Transfer to a warm serving platter or plates. Garnish with the remaining lemon zest. Source: based on Pappardelle with Asparagus and Lemon from Vicki Sebastiani's cookbook Cucina Viansa sold at the Viansa Winery and Italian Marketplace. Heat 2 tsp of vegetable oil in a wok or skillet over medium high heat. Add dried shrimp and dried radish and fry in oil for 30 seconds to a minute. Add green beans, garlic, and red pepper sauce (if using) and stir fry for a minute. Add soy sauce, brown sugar, and vinegar and cook covered until the beans are to your liking. 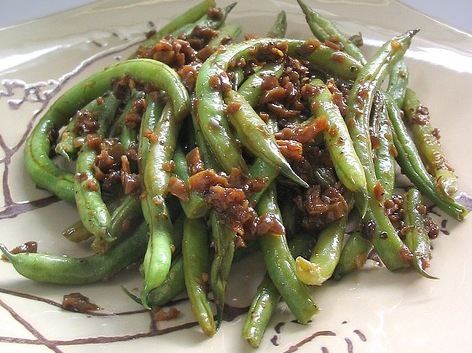 Source: Nook and Pantry "Green Bean Stir Fry" http://nookandpantry.blogspot.com/2007/03/green-beans-sauteed-with-soy-sauce.html accessed August 31, 2009. 1. Boil the pork in boiling water for 20 minutes. Wait until the water is boiling first then drop the pork. Add 1/2 tsp. salt. 2. While we’re waiting for the pork to be done, ground garlic and chili pepper. Put it aside. 3. After 20 minutes of cooking, remove the pork and leave it drain. Save the stock for the next step of cooking. 4. In a small cup, dissolve shrimp paste with 3 tbsp. stock. 5. Now, heat the pan and add vegetable oil. 6. Fry garlic until it has aromatic smell. Add the peppers. Use low heat and quick stir for 5 times. 7. Add boiled pork with some amount of stock and mix well. 8. Next, fish sauce, oyster sauce, soy sauce, and shrimp paste. 10. Add shrimp, add water. 11. Add green beans, stir well, cook for 5 minutes. 12. Add lima leaves, stir well. 13. Serve on a plate with rice. Source: iFoodTV "Spicy Green Bean Recipe Video" http://www.ifood.tv/recipe/spicy_green_bean accessed August 31, 2009. Sara Moulton always loved the original version of this Chinese dish. The only problem was that the fried green beans added a lot of fat. 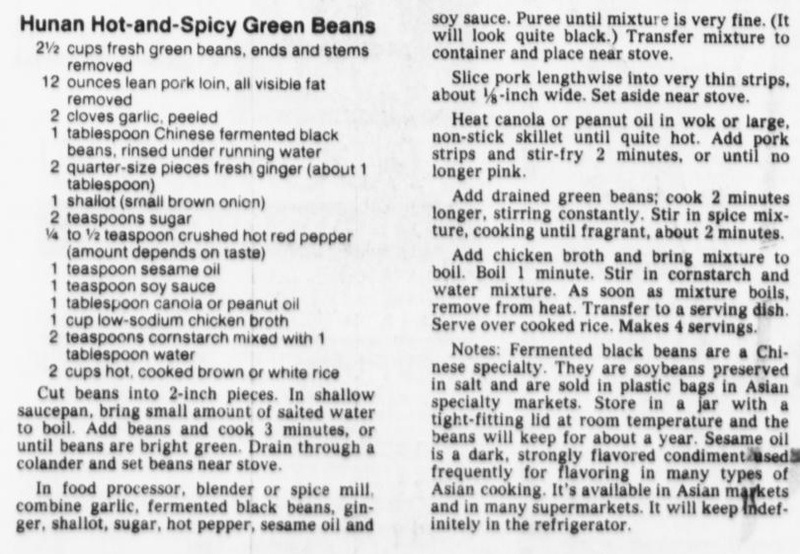 In her recipe for Asian Green Beans and Pork from "Sara's Secrets for Weeknight Meals," Moulton lightens the dish by broiling the green beans. The results are delicious, caramelized beans that won't clog your arteries. The meal is a favorite among the children of the Moulton household. Total prep time: 25 mins. Combine the ground pork with three tablespoons of the soy sauce, three tablespoons of the wine, one teaspoon of the sugar, the garlic and ginger. Combine the broth, the vinegar, cornstarch and sesame oil with the remaining three tablespoons of the soy sauce, one tablespoon wine and two teaspoons sugar. Preheat the boiler to high. 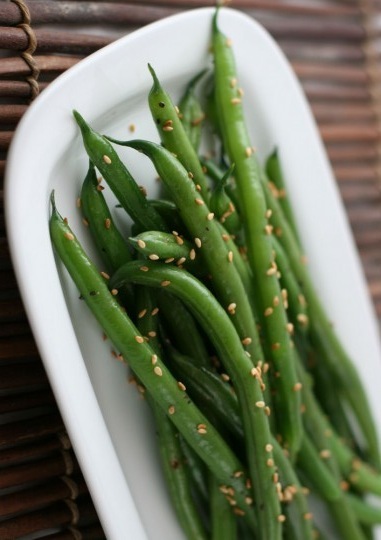 Toss the green beans with two tablespoons of the vegetable oil, 1/4 teaspoon salt, and 1/4 teaspoon pepper. Arrange the beans in one layer on a rimmed baking sheet and broil 4 inches from the heat source, turning occasionally, for 10 minutes to 12 minutes or until golden brown and tender. Meanwhile, heat the remaining tablespoon of vegetable oil in a large skillet over high heat until hot; reduce the heat to medium, add the pork mixture, and cook, stirring until it is no longer pink, three to four minutes. Add the broth mixture and cook for two minutes. Add the green beans and stir until they are coated with the sauce. A favorite side dish to order in Chinese restaurants. A chef listed the ingredients and the tip of blistering the green beans. The amount of chili garlic sauce determines the heat. Heat 2 cups of vegetable oil in a large wok or deep sided skillet to 375 degrees F (190 degrees C). Carefully add the beans to the hot oil, and fry, stirring occasionally, until the beans are blistered, 3 to 5 minutes. Dip the beans out of the oil with a strainer, and quickly rinse them in cold water. Remove the oil from the wok, but do not wipe the pan. Heat 1 tablespoon of vegetable oil in the wok over medium heat, and stir in the garlic, ginger, and green onion. Cook and stir until fragrant, about 30 seconds, and stir in the ground pork. Cook and stir the pork, breaking it up as it cooks, until no longer pink, about 4 minutes. Stir in the chili garlic sauce, chicken broth, and soy sauce, and bring to a boil. Mix the cornstarch with the water in a small bowl, stir into the pork mixture, and let simmer until the sauce thickens, 1 to 2 minutes. Gently stir the green beans into the pork sauce, heat through, and serve. Some recipes call for sauteing the garlic. I prefer just using raw garlic. Bring a pot of water to a boil and season with salt and pepper. Once boiling, add green beans and boil for 2-3 minutes. Drain.and put into a warm serving dish. Add garlic slices and olive oil. Cover the dish and let marinate a very short while. Serve very warm.